It was on of those early days at Brahmagiri. We had just started a small school (if you can call a conglomeration of 28 children in a broken down cow shed that) a few months ago at Brahmagiri and Lalitha, a 10th standard passed ‘Kadukuruba’ tribal woman was the teacher. 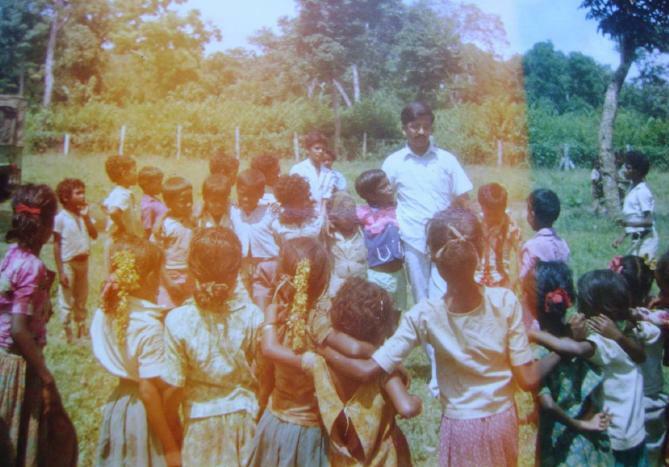 I was the ‘super teacher’ who spent time teaching both Lalitha and the kids. For us, the fun was the lunch break. We used to cook food on a hearth made of 3 large granite stones. The daily meal was the staple ‘ragi balls’ (ragi is a millet) and ‘sambar’. It was indeed a wonderful time of togetherness for all of us. Money was very hard to come by and each day we needed to feed these 28 children and also some of us. It was a real testing time for my own convictions. I used to walk down the busy Devaraj Urs Road in Mysore, meeting with many grocery and provision shop owners, literally pleading with them to ‘gift’ me some grains for feeding these children. Those moments taught me humility and also gave me an insight into how the donor’s mind works. Some of them treated me like a beggar, while a few others appreciated what I was doing. Some were dignified in their gifts, while a few where haughty about them. One of them did not want to be known as a donor but only as a friend of the tribal children. But some wanted their donations to be advertised at every available opportunity. When I was just coming out of one of the shops, I met Prof.Lakshminarayan – father of one of our members Raghuram (now a successful radiologist and an active member at our UK Chapter). I narrated to him my experience at that shop and he was appalled at the treatment I had received. He immediately asked me how much did these kind of donations fetch on a monthly basis. I told him that it was normally between 200-400 rupees and it all depended on the mood of these merchants. Though he and his family lived on a shoestring budget, he spontaneously asked me to collect Rs.200 from him every month (I faithfully did this for quite a few years!). Previous Article (13) The mating cobras!